Sweeten your style with this cute internally threaded steel labret stud. This stylish steel labret features a small silver heart that looks pretty yet discrete. This labret stud is internally threaded which means that the thread is attached to the heart, not the bar. This gives the bar a smooth end that will not irritate your piercing, even if it is sensitive. Beautifully machined in 316L surgical steel. 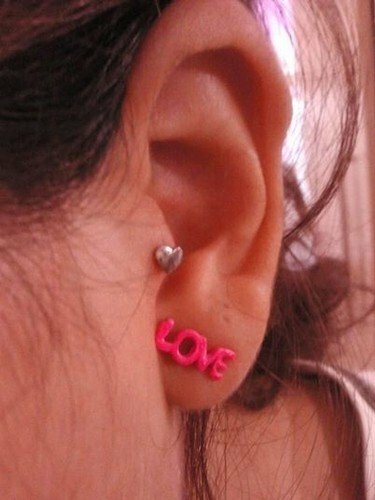 i bought this for my tragus but then decided to put it in my lobe. i thought it was really pretty but i lost the heart while i was sleeping one night and couldn't find it. this is a really cute piece of jewellery but i would recommend you buy a spare one just in case. It is a nice piercing, but I expected it to look better on me. I find it too plain, but its still good! This is a very nice labret i have two 1.2 x 6 in my lobe pierceings there simple yet pretty with a nice smooth finish and fit really comfortable i forget im wearing them.